Brand New Asahi 100 Ounce Silver Bullion Bar LBMA Good Delivery. Asahi bars recently entered the precious metals market in 2016, when the Japanese company bought Johnson Matthey's refining business. Previously, these bars were manufactured by Johnson Matthey, however, the design has remained the same. 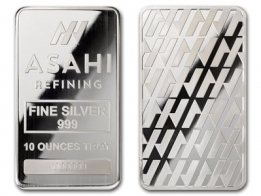 Asahi sell silver bars in 1 Ounce, 10 Ounce, 100 Ounce and 1 Kilogram sizes. Asahi also sell a gold bar in 1 ounce, 10 ounce and 1 kilo sizes. 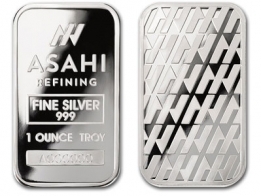 The 100 Ounce silver bar features the Asahi name, the fineness, weight and serial number of the bar stamped on the front. These bars are extruded, not minted. 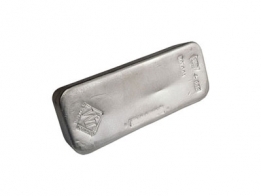 These silver bars are popular with investors worldwide, who prefer to invest into larger increments of silver. These are relatively low premium silver bars, and thus popular with investors.